The Cult of the Supreme Being (French: Culte de l'Être suprême) was a form of deism devised by Maximilien Robespierre, intended to become the state religion after the French Revolution. 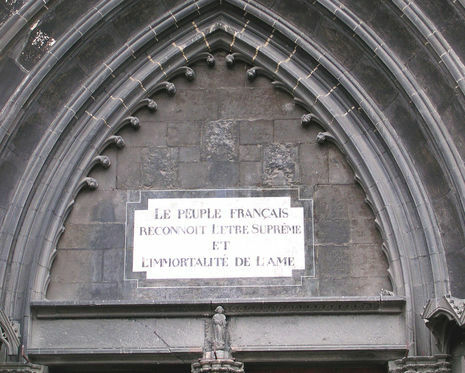 It became popular for ardent revolutionaries to baptise their children not in the name of the Father, Son and Holy Spirit but of Liberty, Equality and Fraternity, the values of the French Revolution. 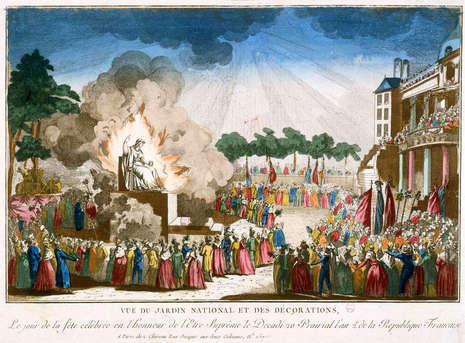 Robespierre's proclamation of the cult as the new state religion in 1794 was possibly one of the factors that prompted the Thermidorian Reaction, which counts The Cult of the Supreme Being among its victims. Also, during this time Robespierre had held a festival and declared himself as a god.